Michael McFadyen's Scuba Diving - Centurion The Centurion was built as a full-rigged clipper by Walter Hood & Sons in Aberdeen, Scotland in 1864. She was 63 metres long and displaced 1004 tons (also reported as 965 tons gross). The ship was built for George Thompson and Company's Aberdeen White Star Line. It replaced a vessel of the same name. 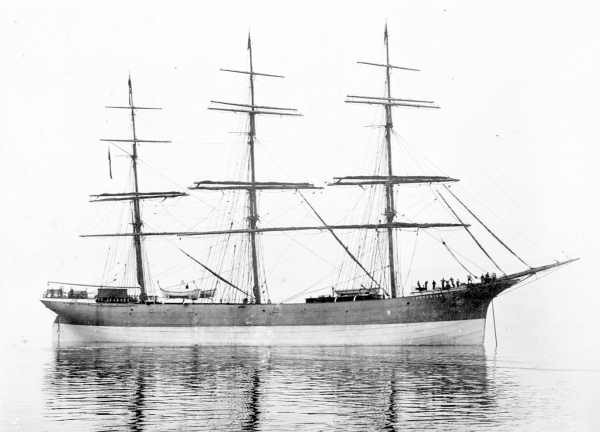 The builder, Walter Hood, built three other ships wrecked in New South Wales. These are the Fame (wrecked in Sydney Harbour), the Queen of Nations (wrecked north of Wollongong) and the Walter Hood (wrecked south of Jervis Bay). The Centurion's maiden voyage was under the command of Captain Thomas Mitchell. Captain Mitchell had worked for Aberdeen White Star Line for a long time, previously skippering the Queen of Nations during 1861 to 1868. The first voyage was to Sydney and it took 79 days (also reported as 69 days in some places). It was said to be a light weather passage and the sheets of her main top gallant sail were not set the whole way. It is also stated that in three successive days she made 360, 348, and 356 miles, but this may be from a different trip. In a letter to Captain Edward (not sure who this is - perhaps from the shipping line), Mitchell said "I was disappointed in the Centurion's sailing power... and one of those white painted French ships... came up and went out of sight ahead". This was with the wind behind. However, when the wind was from abeam she performed better as the following quote shows: "we came up and passed all the ships in sight, but as soon as we got the wind aft again, some of the ships we passed came up and passed us again". Captain Mitchell was also not happy with the first mate calling him "the greatest booby I ever saw" as amongst other things, he could not even use a chronometer sight". The Centurion arrived in Sydney on 10 September 1869. The ship next arrived in Sydney on 22 April 1870, then 22 July 1870. The first is probably at the end of its second voyage from London but the July date must have been a trip from Sydney to somewhere in Asia and back, perhaps to China as it was later involved in carrying tea. It is possible that it went to China to collect tea and then transported it to Sydney and also London. The next time the Centurion was in Sydney for certain was a year later on 2 June 1871 (it may have been there in late 1870 as well). The skipper on this trip, reported as his second to Sydney, (not as I first assumed the second trip of the ship), was again Captain Mitchell. He had his family aboard. On the way back to London in 1871, Captain Mitchell suffered a stroke and died. This was 75 days out of Sydney just before reaching the English Channel. The for the third voyage (of the ship or to Sydney - not sure), was Captain Thomas Taylor. The ship also came to Sydney 6 July 1872, 5 September 1873 and 7 July 1874. On 8 December 1874 the Centurion had a collision with the PS Agnes Irving on Sydney Harbour. The Agnes Irving sank just over five years later on 26 December 1879 off the entrance to the Macleay River, just north of South West Rocks in northern New South Wales. As mentioned above, there is some confusion about the voyages for the ship as some reports are very ambiguous about the trip numbers and what happened. This has led me to know that it was not the second voyage of the ship when Captain Mitchell died, but perhaps his second voyage. As you can see from above, the Centurion's voyage from England to Australia and back was under six months (less than 80 days each way plus loading/unloading time). Therefore, the first voyage should have been completed about about mid to late December 1869. The next trip would have finished about June or July 1870 (confirmed based on being in Sydney 22 April 1870). The third voyage would have finished about December 1870. It appears that the list of arrival dates in Sydney is incomplete or the ship went to other locations at times. It is reported that she also made some creditable tea passages (to China or India/Ceylon) but was mostly kept in the Sydney trade. In 1871 she went out in 77 days and in 1872 in 78 days. From 1882 on it is not known where the Centurion traded to or from. At some time, the Centurion was converted to a barque and even later on, transfomed into a bulk cargo carrier. She then appears to have changed her ports of call. On the morning of Sunday 16 January 1887, "one of the most extraordinary accidents to shipping that has been recorded for a long time past happened..." (Sydney Morning Herald 17 January 1887). At 1 am that Sunday morning, the Centurion left its wharf at Dawes Point (at the spot on the southern side of the Harbour where the Sydney Harbour Bridge now stands) being towed by the J. & A. 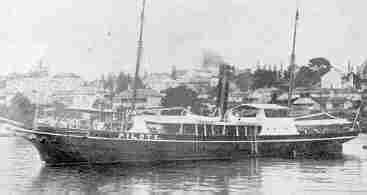 Brown steamer (also reported as a tug) SS Pheobe. The Centurion was loaded with 400 tons of coal and 60 tones of ballast stone and bound for Honolulu via Newcastle (NSW). It was presumably to collect more coal in Newcastle. The weather conditions were said to be poor, with heavy southerly winds. Under the command of Captain Sutherland of the Phoebe, the two vessels proceeded down the Harbour for the open ocean. As they neared Sydney Heads, another barque, the Manhegan, was seen to be anchored right in the middle of the Heads. She was anchored here with her tug, the SS Young Bungaree, keeping her from dragging anchor and running aground. Captain Sutherland saw that if he kept going they would get tangled up with the Manhegan. At the same time, a massive rain squall appeared dropping visibility to almost zero. He therefore put his engines into reverse. Unfortunately, the tow rope went slack and got fouled around the Phoebe's prop. As you could imagine, this caused a lot of problems. The Centurion drifted towards the rocks at North Head and very soon the tow line was cut by the prop. The Centurion was now going towards the rocks so Captain Charles Taylor (this was his first trip on the Centurion) let an anchor go (with 110 metres of chain) but under the strong southerly blowing, the ship was soon aground near Old Mans Hat (halfway between the Inner and Outer Head). The pilot vessel, Captain Cook was assisting the Manhegan by taking the strain from the anchors in the strong winds. It quickly came to the aid of the Centurion but it was too late. The Captain Cook dropped two lifeboats into the water and they approached the stranded vessel with some difficulty. They proceeded to the bow of the Centurion and the crew jumped off the wreck to safety. Captain Taylor was the last to leave. It is reported that within 30 minutes, the Centurion slipped off the rocks and disappeared beneath the seas, although another report says that the Phoebe attached another line to the ship. This report says that the Centurion was pulled off the rocks and soon sank. Neither the ship (valued at £9,000) nor its cargo (valued at £250) was insured. It is not known when the wreck was discovered by scuba divers, but because it is inside Sydney Harbour, it presumably was dived on back in the 1950s. 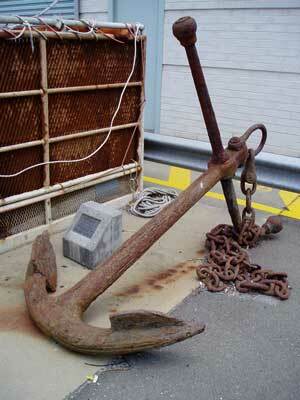 The anchor of the Centurion was recovered by the NSW Police Divers in 1988. It is currently not on public display but is in public ownership. It is located at the moment at the Head Office of the NSW Maritime Auhtority where it is supposed be be undergoing restoration. However, it is known to be just sitting in the open air and has undergone no resoration work. Hopefully it will be resored and put on display at some time. The Centurion is now located just off Quarantine Point, well inside the Heads of Sydney Harbour. For the western mark, locate the white house over the Grotto Point light. For the south-western mark, place the large tree at Mosman on the ridge in front of Centrepoint Tower. To the north, you will be almost square on to the block of units at Little Manly and place the red roof of the building behind and just showing to the left. For another northern mark, place the flag staff at the Quarantine Station to the left of the large tree on the ridge. See the diagrams below. The GPS Reading for the wreck is 33º 49' 08.5" S and 151º 16' 47.6" E. Note that most of the GPS Readings on my Web Site are taken using AUS66 as the map datum. If you use another datum you may be about 220 metres off the wreck. See my GPS Page for more details and how to convert readings. This is many hundreds of metres from where it is supposed to have hit the rocks. 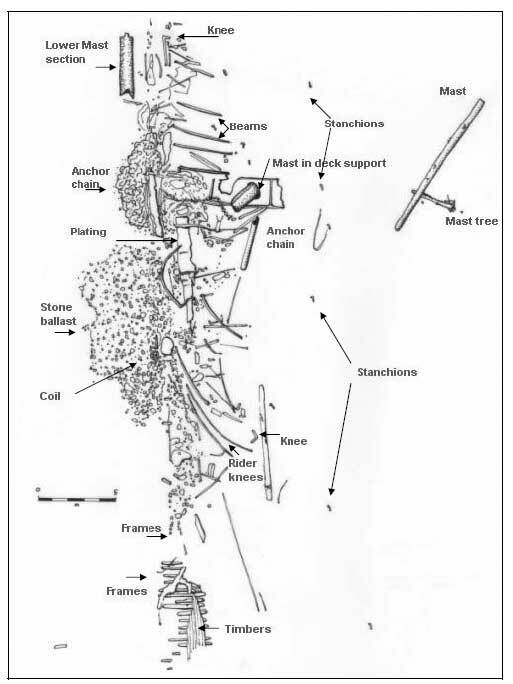 In about 18 metres of water on a sandy bottom, the wreck consists of twisted iron, masts, timber and some other pieces of the ship. The wreck is in two parts, with a major section of the wreck located under the sand. Things to see include the remains of the masts, anchor chain, coal, the stone ballast, plating, beams and sometimes, timbers. 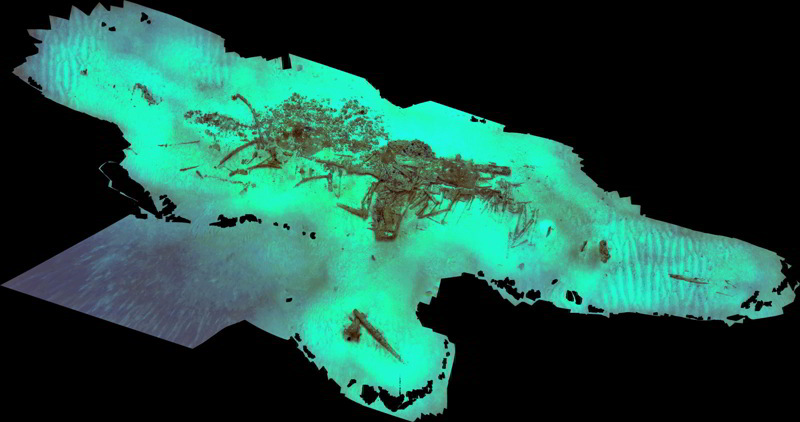 The following diagram and the panoramic photograph at left show the major part of the wreck. The Lower Mast Section as identified in the diagram is one third of the way down the photograph on the left side. The coal and stone ballast is the darker material on the left side of the photo. The diver is to right of the coil. While the actual wreck site is not very large and can be explored in 15 minutes or so, the wreck has attracted a lot of fish life which greatly adds to the quality of the dive. A very good good introductory wreck dive or also good as a night dive. The visibility here is never very good, but more than enough to enable you to enjoy the dive.